It’s a fight that has dipped all but below the radar, quite unfairly, and it goes down this Friday afternoon UK time (Friday morning US time) in Japan. 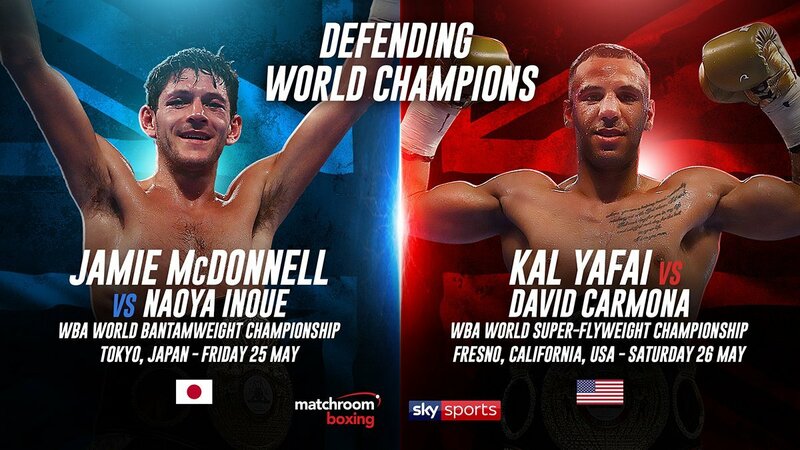 Reigning WBA “regular” champ at bantamweight, Jamie McDonnell of Doncaster faces one of the toughest away assignments any British boxer has ever had to deal with as he defends against unbeaten power-puncher and current pound-for-pound entrant Naoya Inoue in Tokyo. Unbeaten at 15-0(13) and looking to win his third world title in as many weight classes, “The Monster,” as Inoue is known, will be just four fights slower to do it than Vasyl Lomachenko should he beat McDonnell. But the defending champion, who will be making the seventh defence of his title, has other ideas. Having touched down in Tokyo, McDonnell, who has never been stopped during his 29-2-1(13) pro career, is sure he can outbox the smaller and younger man. McDonnell tells Sky Sports he is in the best shape of his life and how he has no fear of the big-hitter who won his first world title (down at light-fly) after just six pro outings. McDonnell insists he can “ box with anyone,” and that includes the lethal 5’5” challenger. McDonnell will enjoy quite a height advantage at 5’10” (McDonnell really is a tall man for an 118 pound fighter) and he has more prop experience. But “The Monster” has that look about him the way the special fighters do. A wicked puncher to both head and body, a fan can actually hear Inoue’s shots as they land; even when viewing on TV. God knows how it feels to be hit flush by one of the 25 year old’s bombs. McDonnell will try his best not to find out, sure as he is to adopt a smart hit and not get hit approach. At least the 32 year old will try and stick to such a game-plan. The feeling is, though, that at some point Inoue will land a heavy shot, either to the head or to the midsection, and this is when the fight will get very interesting. If McDonnell can take Inoue’s shots – and it could prove to be a tall order – we might just witness a classic. Far too often, the little men of the sport get ignored or close to it (again, not that McDonnell is particularly small in stature at 5’10” and Inoue is a giant in Japan), and the off-peaak hour at which this Friday’s fight will take place at won’t help. But those fans who do take the time and trouble to tune in will almost certainly be pleased they did so. Will we see a great away win scored by a British fighter, or will we see the ongoing march to stardom and boxing history continue for Inoue? Often we hear the phrase, ‘no way can this one go the distance,’ and it may prove to be a correct assumption here. But a quick blowout seems unlikely. McDonnell is up for this fight in a big way and we fans should be too. Previous boxing news: Earnie Shavers: Was he really the hardest punching heavyweight never to have won the world title?